Languedoc : the area as a whole, or the area excluding the department of Pyrénées Orientales (66). Roussillon : the French part of historic Catalonia, essentially corresponding to the department of Pyrénées Orientales (66), in the south of the region. Cevennes : mountainous area running from north of Montpellier to the northeast of Languedoc, mostly in the Gard (30) and Lozère (48) departments. Highest point Mont Lozère - 1702 metres. Corbières : inland area of the Aude (11) department, famous for its vineyards. Margeride : northern part of Haut Languedoc, mostly in the Lozère (48) department. Aubrac : very sparsely populated high plateau area on the borders of Languedoc, Auvergne and Midi-Pyrenees. Languedoc is best known in France for two main reasons; firstly as a holiday destination, secondly as France's biggest producer of wine. 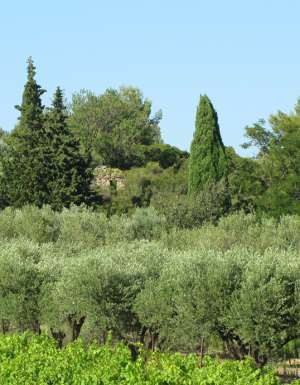 In terms of image, it is a region associated with sunshine and the seaside, but also with its Mediterranean vegetation of vines, olive trees and thin cypress trees, as in the photo on the right. The area known as Languedoc today covers just a small part of the much larger area of France that was known in the Middle Ages as the pays de Langue d'oc. The "Langues d'oc" was a name given to a whole family of French dialects spoken in the southern half of France. In mediaeval times, France was divided linguistically into two main areas, the northern half where people spoke languages that have evolved to produce modern French; and the southern half of the country where they spoke languages somewhere between northern French and Spanish, known as Occitanian French, or langues d'oc. People from the north had difficulty understanding people from the south, and vice versa. The dividing line between the two areas ran from the Charentes in the west to Geneva in the east. Today the Languedoc is part of the large region of "Occitanie", another name that was once used to refer to the whole of the south of France. The name Languedoc-Roussillon until 2016 defined a region stretching from the Rhone to the Pyrenees - a region that still maintains an identity, but is no longer an official administrative division of France . The coastal plain of Languedoc is France's largest wine-producing area. However the Languedoc wine-producing area has been considerably reduced in size in recent decades following a fall in the consumption of French vin ordinaire and table wines, which used to be the main speciality. To fight back, Languedoc wine producers have reinvented their industry, turning to the production of "Vins de Pays" and more quality wines. On account of the sun and warm climate, and also the varieties used, Languedoc wines tend to be rich and full-bodied, and have an above average alcohol content. This has allowed the area also to specialise in strong aperitif wines, the best known of which are Banyuls, Frontignan and Rivesaltes. The coast of Languedoc was, until the twentieth century, relatively sparsely populated, as it was bordered by large expanses of wetlands which bred mosquitos, making the environment relatively inhospitable. Apart from the extreme south of the region, where the Pyrenees come down to the coast, the only coastal town of any importance was Sète, a fishing and trading port beside the only real hill along the central Languedoc coast (photo right). But now the marshes have been drained, and in the 1960s there was massive development of new coastal holiday resorts such as la Grande Motte, Le Grau du Roi, Cap d'Agde or Valreas Plage. Today, thanks to its long sandy beaches, hotels and campsites, the Languedoc coast, known as the Amethyst coast, is a popular holiday destination. Inland from the coastal plain, most of the Languedoc is characterised by dry rocky hills. 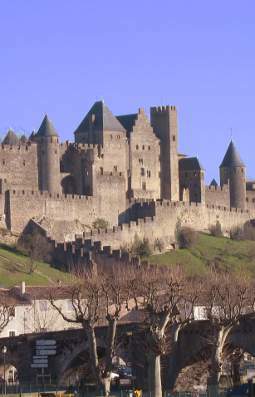 The exception is the department of the Aude, that stretches inland in the direction of Toulouse, and is famous for its vineyards and its agriculture. To the south, the Pyrenees and their foothills rise steeply towards snowy peaks; and along the northern edge of the coastal plain from Narbonne to Nimes, lie the southern uplands of the Massif Central - a very sparsely populated and arid area. The inland department of Lozère, which covers most of "Haut Languedoc", lies at an average altitude of 886 metres, making it one of the highest departments in France. The dry uplands of Haut Languedoc are cut through by impressive deep river valleys, such as the famous Tarn Gorge. With the exception of the department of Lozère, Languedoc enjoys a mild to warm Mediterranean climate, making the area attractive to holidaymakers for a good part of the year. Perpignan enjoys a warmer average year-round climate than any other city in France, notably due to its very mild winters. 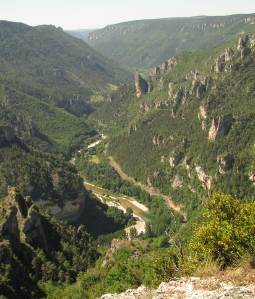 The whole of the coastal area enjoys a dry climate for most of the year, punctuated by occasional monsoon-like heavy rainfalls, known as Cevenol storms (Cevennes storms), which can dump large quantities of water in a very short space of time on the southern slopes of the Cévennes, causing major flooding of rivers such as the Gard or the Herault. This happens most often in late summer and early autumn when warm wet air comes in of the Mediterranean. Le Grau du Roi, Palavas, La Grande Motte : Large modern seaside resorts catering for summer holidaymakers and weekenders from nearby Montpellier. Sète, Agde, Gruissan : established towns with old quarters. Sète is a small port on the coast, with large beaches, Agde is slightly inland, but close to the beaches. Canet en Roussillon, Valras Plage, More modern seaside resorts, developed since the 1960s. Plenty of long sandy beaches easily accessible. Argelès sur Mer, Collioure, Banyuls sur Mer. 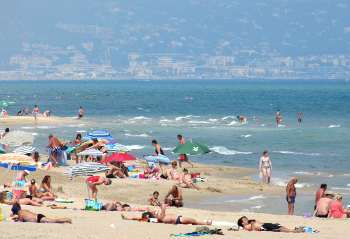 Established seaside resorts in the south of Roussillon, between Perpignan and the Spanish border. The rocky coastline and presence of the railway line between Perpignan and Barcelona ensured an early development of these old fishing villages as tourist resorts. Collioure has long been popular with artists and painters. The Cevennes national park. Covering much of the southern Cevennes, this is one of France's six national parks. An area traditionally devoted to sheep breeding and forestry, it is the only French national park whose core area is inhabited and worked. Narbonne regional park. South and east of Narbonne, a park including areas of traditional Languedoc wetland, and dry rocky areas of "garrigue", characterised by poor vegetation and an abundance of semi-desert plants. Haut Languedoc regional park. Divided between the regions of Languedoc Roussillon and Midi-Pyrenees, this is an area of generally arid hill country with agriculture, sheep breeding and forests. Catalan Pyrenees regional park. Includes the whole of the inland part of the Pyrenees Orientales department, west of Prades; medium to high mountain terrain containing several wildlife reserves. Popular with hikers and - in winter - with skiers. 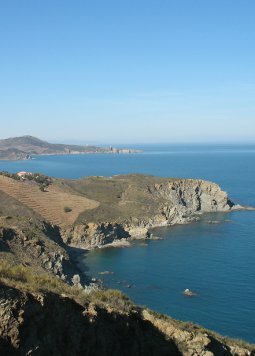 Roussillon coast, near Banyuls and the Spanish border. 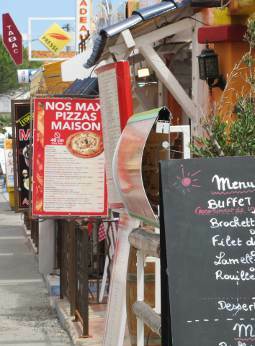 Languedoc resorts have plenty of restaurants and eateries for all tastes. 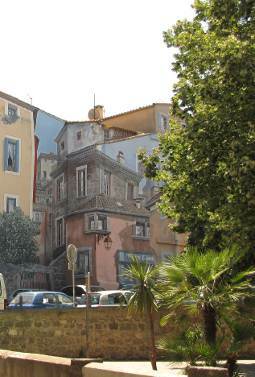 Trompe-l'oeil mural in old Agde.